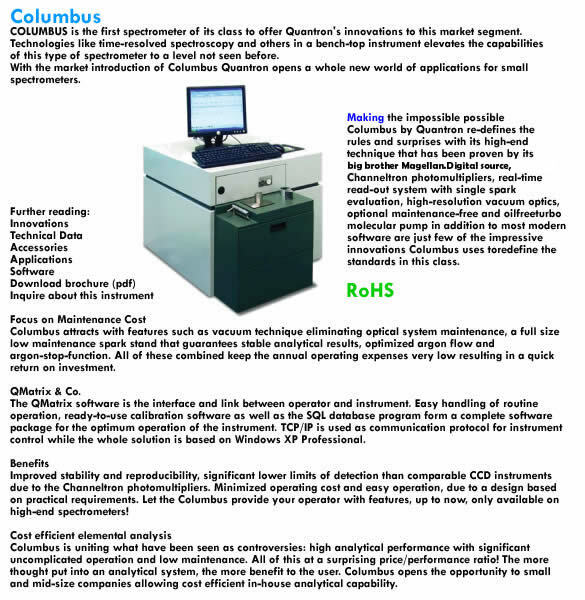 COLUMBUS is the first spectrometer of the analytical premium class to offer Quantron's innovations to this market segment.Technologies like time-resolved spectroscopy and others in a bench-top instrument elevates the capabilities of this type of spectrometer to a level not seen before. With the market introduction of Q6 COLUMBUS, Bruker-Quantron opens a whole new world of applications for small spectrometers. COLUMBUS by Quantron re-defines the rules and surprises with its high-end technique that has been proven by its big brother Magellan. Digital source, Channeltron photomultipliers, real-time read-out system with single spark evaluation, high-resolution vacuum optics, optional maintenance-free and oil-free turbo molecular pump in addition to most modern software are just few of the impressive innovations Q6 COLUMBUS uses to redefine the standards in this class. Improved stability and reproducibility, significant lower limits of detection than comparable CCD instruments due to the Channeltron photomultipliers. Minimized operating cost and easy operation, due to a design based on practical requirements. Easy handling of routine operation, ready-to-use calibration software as well as the SQL database program form a complete software package for the optimum operation of the instrument. TCP/IP is used as communication protocol for instrument control while the whole solution is based on Windows XP Professional. high analytical performance with significant uncomplicated operation and low maintenance. All of this at a surprising price/performance ratio! The more thought put into an analytical system, the more benefit to the user.